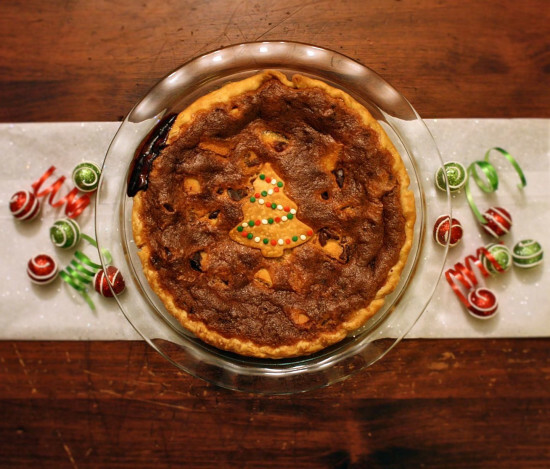 I’ve made this pie for various occasions, with different decorative toppers, but this Christmas pie has been the prettiest and it was one of 5 Berger Cookie Pies I made this Christmas (some of which people even paid for!). 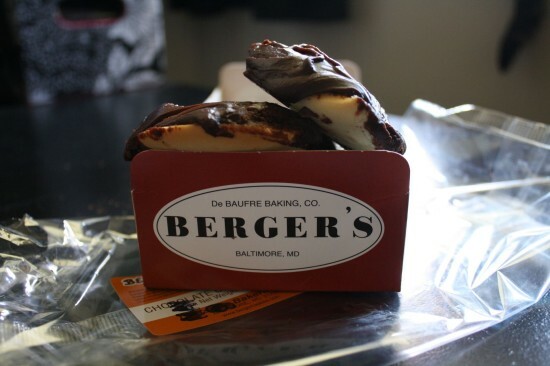 If you’re not from Baltimore, Maryland or somewhere near Maryland, you’ve probably never even heard of Berger Cookies. They are a delicacy specific to our area, characterized by their chocolate fudge-like topping on a shortbread cookie. So rich, you can only eat one or two at a time. I’ve never tried to make a Berger Cookie, because I live near them so why try, but I have seen people online come up with cookies that look similar. You could try that or you can actually order Berger Cookies online. And if you ever travel through Baltimore, I’d encourage you to pick some up. They freeze well, so they’ll last, and even if you don’t give this pie a try, they’re a cookie you want to taste in your lifetime. Believe me. Start with your favorite pie crust recipe. Or just use Pillsbury. Roll out dough and place into pie pan. Fill pie pan with cookie chunks. Mix sugar, brown sugar, and flour in a bowl. Add in eggs, one at a time. Add butter and vanilla, stirring constantly. Pour mixture over cookies chunks. Bake at 350° for 45-55 minutes. *Best served after cooling completely and being stored in the fridge overnight. Let sit at room temperature about 1 hour prior to serving.